Just Another Day...: Sew Cool! 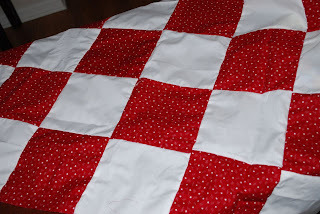 I'm quite excited to share with you all that I am picking up a knack for sewing! 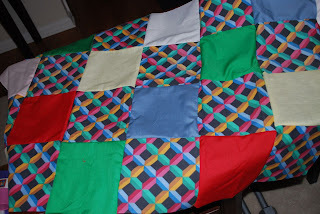 My church is making quilts to send to children in Swaziland, and I've been able to work on two of them this week! It's such a great cause, and I figure it's about time I learn to be more domestic and rip out my mom's sewing machine! Here are some pics of my handiwork. Keep in mind - I didn't get to choose the fabric. The church provided me with the fabric squares and I just had to sew them together. In other words, they aren't the cutest things (I would've picked something quite different than these), but ultimately they will serve their purpose once they make it to Swaziland.